This is the statement said by Neetu , an attendee of the conference held at Vijay Vihar, New Delhi on 25 May 2014, on the occasion of “World No Tobacco Day 2014”. 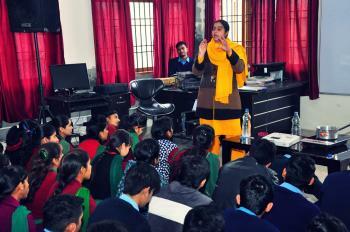 That conference was attended by 25 youngsters, who were sensitized about the issue. The event started with an introduction of the organization and its multifaceted spiritual and social activities, followed by the introduction of the participants through interactive activities. Sadhvi Anuradha Bharti Ji, working actively and rigorously since 4 years on this subject of drug abuse, explained about the WORLD NO TOBACCO Day 2014, and its significance; followed by a brief introduction on the subject ‘Prevalence of tobacco and its products in the society’. 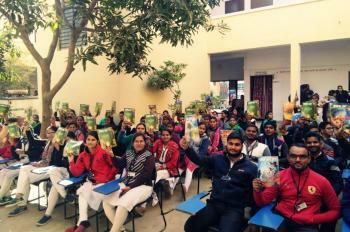 Subsequently, Sadhvi Shitabha Bharti Ji, the program in charge of BODH - the drug abuse eradication program, DJJS, talked about various Myths on tobacco use, prevailing in the society. Gagan , a science graduate said “ these days, smoking or substance abuse has become a trend, I was persuaded, many a times, to try drugs, in the name of stereotypes and the prevailing statements like ‘be a man not a boy’ . Mr. Titu, an active youth worker from a political party confronted Gagan, saying ‘it depends upon one’s personality, if you are strong, then you can also create a positive peer pressure rather, getting influenced by the negatives. All participants were actively sharing their own real life instances that made the discussion healthy and exhaustive. Sadhvi Anuradha Bharti Ji, also gave a presentation on how not being an indigenous crop, tobacco cultivation and manufacturing (like cigarettes, bidis, pan masala, pan, kaini and others) came into existence. She said that people generally think that if I am taking drugs then I am hurting only myself – “ किसी को क्या फर्क पड़ता है” . Sadhvi Ji took this point in greater detail and explained how demand and supply rule of economics work in the business of drugs trafficking and highlighted about some important national issues viz-a-viz ‘national income deficit’, increase of national health care, loss of productivity, increase of crime, demolition of character and control, so on and so forth. These days, a large number of youth idealise and follow celebrities and also try to live their lives according to their ideals and icons. A video was played by Sadhvi Shitabha Bharti ji to unfold the reality that ‘how and what part does media play’ in our lives and how these are affecting us. She also said that - one is responsible for one’s own decision, so get the facts and reality first, so as to ensure the faculty of right decision making in your life. Various posters made by the youth during the poster competition, held on 23 May 2014, too, were exhibited and discussed. 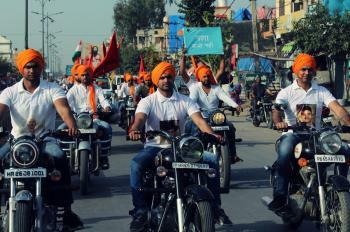 The youth presented there, proved that it was not the end but a start to revolutionize the world with one message i.e. 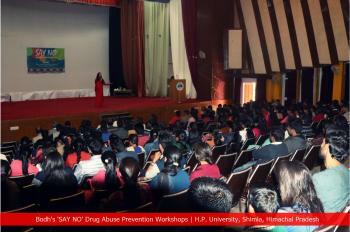 ‘Let’s establish a drug free society’.